In a number of species, partial pneumonectomy initiates hormonally regulated compensatory growth of the remaining lung lobes that restores normal mass, structure and function. Compensation is qualitatively similar across species, but differs with gender, age and hormonal status. Although the biology of response is best characterized in rats, dogs have proven valuable in defining post-operative physiological adaptations. Most recently, mice were recognized to offer unique opportunities to explore the genetic basis of the response, as well as to evaluate associated detrimental effects of pathophysiological significance in animals exposed to carcinogens. The pneumonectomy model thus offers powerful insight concerning adaptive organ growth. Partial pneumonectomy (PNX), the surgical removal of a lung lobe or lobes, substantially diminishes diffusion capacity by reducing the total number of alveoli and the associated vasculature available for gas exchange. The immediate challenge to a pneumonectomized animal is to maintain adequate gas exchange following resection of lung tissue. Physiological compensation for the loss of lung mass is achieved primarily through two mechanisms: enhancement of diffusion capacity in the remnant lung, and/or generation of new pulmonary gas exchange units. PNX elicits a number of anatomical changes within the thoracic cavity that augment the diffusion capacity of the remaining lobes. Ligation and surgical removal of one or more lobes directs the entire cardiac output into remaining lung tissue and creates an empty hemithorax that results in a shift of the mediastinum toward the vacated thoracic compartment [1,2]. In addition, increased space within the chest releases constraints on lung expansion imposed by the thoracic wall. Increased lung inflation on inspiration can then recruit alveoli that might have been incompletely ventilated prior to PNX. Likewise, increased pulmonary blood flow to the remaining tissue may contribute to tissue distension and enhance parenchymal perfusion. As a consequence of these post-surgical anatomical changes, adequate gas exchange can be re-established after PNX by exploiting the physiological reserves of diffusion capacity in the remaining lung tissue. A second adaptive response to PNX is compensatory growth of the remaining lobes. In a variety of mammalian species, PNX stimulates rapid compensatory lung growth, restoring normal mass, structure and function. Although post-PNX compensatory lung growth has been documented in rabbits , mice [4,5], ferrets [6,7] and dogs [8,9], the response is best characterized in the rat [10,11,12]. Excision of the single lobe of the left lung in rats removes 35% of the total lung mass. Following left PNX, the right lung mass remains stable for 2 post-operative days; subsequently, the right lung mass increases at an accelerated rate until a value equivalent to the total lung mass in sham pneumonectomy (SHAM)-operated animals is achieved . In rats of about 300 g body weight (BW), restoration of total lung mass is complete approximately 14 days after left PNX . The post-PNX compensatory growth response is independent of the lobe or lobes removed ; all remaining lobes grow rapidly in proportion to their initial mass until normal total lung mass is restored [1,11]. Increases in lung volume parallel accumulation of tissue. The volume of the residual lobes thus increases until a value similar to that of both lungs in age-matched control animals is achieved . The issue of whether restoration of lung volume is primarily due to formation of new alveoli [3,8] or to expansion of existing air spaces  has been subject to much investigation. Development of more sophisticated morphometric methods has permitted accurate analysis of lung volume and alveolar number. The latest data indicate that new alveoli are indeed formed during the growth response . Compensatory growth of alveolar septal tissue restores both alveolar and capillary surface areas to values comparable with those in lungs of SHAM-operated controls (Table 1), resulting in complete normalization of gas exchange function in lungs of PNX animals [9,14]. Data from the right lobes of PNX and ADX/PNX animals are calculated from references 13, 30 and 31, as indicated, and are expressed as percent of values from the right lung of adrenalintact post-operative day 14 SHAM rats. ADX, adrenalectomy; PNX, partial pneumonectomy; SHAM, sham pneumonectomy. * = P < 0.05; value elevated as compared to SHAM value. Age and gender can also modulate post-PNX compensatory lung growth. Whereas the general characteristics of the response are similar in both adult and immature animals of the same species , the post-surgical interval necessary to replace the resected tissue is substantially shorter in young animals. Young rodents undergo a vigorous compensatory lung growth response that exceeds normal maturational lung growth, restoring morphological and gas diffusion properties to values observed in both lungs of age-matched controls within the first postoperative week [8,14,15]. Nevertheless, the absolute rate of gain in lung mass is nearly equivalent in young and adult rats . In as much as left PNX removes less tissue in young animals , restoration of total lung mass is completed more rapidly. A similar difference in the rate of compensatory lung growth has been reported in studies examining the effects of gender on lung growth . Female rodents, which are smaller than age-matched males, complete post-PNX compensatory lung growth more rapidly . Following PNX, rapid changes in gene expression have been detected in the remaining lobes prior to increases in DNA content or tissue mass. As early as 30 min after surgery, expression of the immediate early genes c-fos and junB is elevated . Concurrent changes in cAMP content and the activities of several cAMP-dependent enzymes are observed during the early post-PNX interval [19,20]. Activity of both calmodulin  and ornithine decarboxylase increases in the remaining lung of mice following PNX . It is probable that altered expression and activity of these intracellular molecules play a role in the cascade of intracellular signal transduction events that ultimately lead to the compensatory growth response. Biochemical analysis indicates that elevations in DNA polymerase and thymidine kinase activity precede increases in DNA content in the remnant lobes . DNA synthesis, as measured by [3H]thymidine incorporation, is increased within 24 hours after PNX and remains elevated for at least 4 days [2,22]. Total protein, RNA and DNA content increase in concert, indicating that post-PNX compensatory lung growth is predominantly due to hyperplasia rather than hypertrophy . Morphometric analysis confirms significant post-operative increases in capillary endothelial, type I and type II epithelial, and interstitial cell numbers (Table 1). Peak levels of [3H]thymidine incorporation, measured by audioradiography, are observed in endothelial cells, interstitial fibroblasts and alveolar type II cells within 3 days after surgery . On post-operative day 6, labeling of the epithelial cell DNA is evident in most alveoli, but is more predominant in type I cells than in type II cells . This time course is consistent with type II cell to type I cell conversion during the growth process [4,23]. Collectively, these observations indicate that increased lung mass following PNX is due to induction of cell proliferation in the residual lung tissue, rather than hypertrophy of the remaining cell populations . Several general hypotheses have been advanced to account for events that initiate cellular and molecular changes that lead to compensatory lung growth. Mechanical signals, transient hypoxia associated with thoracotomy, and elevated blood flow have been considered; however, no single event has been proven to account for the growth response. Increased inflation or elevated blood flow to the remaining lobes may be important initiating events in the post-PNX response . Space created within the thoracic cavity allows increased inflation of residual tissue as the pneumothorax is reduced. This expansion or 'stretch' of the tissue may signal subsequent tissue growth . Increased lung inflation results in elevated cAMP content , increased protein kinase A activity , and immediate early gene expression, responses very similar to those observed following partial PNX . Expansion in fetal lungs promotes both tissue growth and differentiation of type II cells into type I cells . Similarly, mechanical deformation of lung fibroblasts in vitro stimulates both cellular proliferation and growth factor production . Furthermore, availability of space within the thoracic cavity modulates the extent of compensatory lung growth. Filling the vacant hemithorax with inert material, such as sponge or wax, prevents both the shift of the mediastinum toward the contralateral hemithorax and overinflation of the residual lobes. Analysis of remnant lung from PNX animals subjected to intrathoracic plombage reveals that the mass and proliferative status of the residual tissue closely resemble that in SHAM-operated animals [1,2]. These observations suggest that reduction of intrathoracic space inhibits compensatory growth. Remarkably, removal of thoracic plombage 3 weeks–9 months after PNX elicits rapid increases in both lung volume and mass that are characteristic of those observed during the immediate post-operative compensatory interval [6,26]. Taken together, these studies underscore the essential role of mechanical signals in post-PNX compensatory lung growth. Thoracotomy equilibrates intrathoracic pressure with that of the atmosphere, causing both lungs to collapse. A mild hypoxemia is induced in the time needed to ligate and remove a single lobe . Surgical closure of the chest cavity and evacuation of the pneumothorax restores both regular breathing and arterial oxygen content; nevertheless, transient perioperative hypoxemia must be considered as a potential signal for initiation of the compensatory response. Intubation and ventilation of rats during thoracotomy does not change the extent or biochemical nature of the subsequent growth response in spite of significant improvements in perioperative PO2, PCO2 and pH . It is therefore unlikely that transient, surgically induced hypoxia is involved in initiation of compensatory growth. Post-operative changes in pulmonary blood flow have also been considered as possible signals for compensatory lung growth. Increased perfusion, reflecting constant cardiac output to the residual lung tissue, could cause physical distention of the pulmonary vasculature, resulting in a mechanical signal for lung growth and a concurrent increase in growth factors and/or nutrient availability. The effect of increased blood flow has been measured directly in ferrets using a novel technique . Arterial vessels supplying the caudal left lobe were banded prior to right PNX. The procedure prevented an increase in post-surgical blood flow to this lobe; subsequent physiological and biochemical analyses revealed that the caudal lobe underwent compensatory lung growth in a manner similar to the left cranial lobe where blood flow remained intact. These data provide strong evidence that elevated blood flow is not critical to initiate the compensatory growth response. In summary, most recent efforts to elucidate signals responsible for initiating post-PNX lung growth indicate that the major stimulus to growth is mechanical strain in the remaining tissue. Although elevated pulmonary blood flow and transient hypoxia occur following PNX, current data suggest they do not contribute significantly to initiation of the overall response. The most substantial evidence for hormonal regulation of post-PNX compensatory lung growth stems from investigations that involved bilateral surgical ablation of the adrenal glands, or adrenalectomy (ADX), which alone does not stimulate normal lung growth to a significant extent . Adrenal hormone deficiency, however, has a marked effect in PNX animals. ADX performed prior to PNX (ADX/PNX) increases the right lung mass above that observed in rats subjected to PNX alone, surpassing combined right and left lung mass in SHAM-operated controls. Accumulation of additional lung tissue in ADX/PNX rats is reflected in increased volumes of all tissue compartments (Table 1). Biochemical and morphological characteristics of compensatory lung growth after ADX/PNX are similar to those following PNX alone [28,29,30,31], with the exception that alveolar wall thickness increases in ADX/PNX animals . These abnormal changes are rectified over a more prolonged post-operative interval . Chronic treatment of ADX/PNX animals with an exogenous glucocorticoid, such as hydrocortisone acetate, prevents the effects of ADX, thereby limiting lung mass to post-PNX values [28,29]. Glucocorticoids thus appear to regulate the extent of compensatory lung growth and thereby aid in maintaining appropriate architecture of the alveolar–capillary barrier. Growth hormone (GH) has also been demonstrated to participate in regulation of the compensatory response. Following PNX, rats implanted with a subcutaneous GH-secreting tumor (MtTF4) underwent a compensatory growth response similar to non-tumor-bearing controls; however, lung growth in MtTF4 rats was associated with a greater lung volume . These data led to the proposal that GH modulates the characteristics of compensatory lung growth in PNX rats. It is noteworthy, however, that MtTF4 tumor cells also secrete adrenocorticotropic hormone and prolactin ; it is not clear what effects these hormones may have had during the post-operative interval. A more recent study reported elevated serum GH levels on post-operative day 3 in pregnant PNX rats, as compared with non-pregnant animals . The extent to which GH modulates post-PNX lung growth is currently not completely understood. Compensatory lung growth studies performed in GH transgenic mice may provide more insight into these issues . Growth factors have been proposed as regulators of compensatory lung growth. Serum collected from PNX animals provides evidence for systemic release of growth factors [36,37]. DNA synthesis increases in type II cells cultured in the presence of serum from PNX animals, as compared with cells cultured in medium supplemented with serum from SHAM-operated controls [36,37]. Biochemical analysis of serum-derived mitogens led investigators to propose a role for somatomedin C from these observations ; however, direct measurement of serum somatomedin C failed to support this hypothesis . Conversely, airway lavage fluid collected from PNX rats was shown to stimulate fibroblast proliferation in vitro, an effect that was neutralized by anti-insulin-like growth factor (anti-IGF) antibodies . In addition, elevated serum somatomedin C was found in pregnant rats 2 and 5 days following PNX . A more thorough study of IGF expression and function during post-PNX compensatory lung growth failed to demonstrate differences between the lungs of PNX and SHAM-operated animals in either IGF-1 mRNA abundance or serum IGF-1 levels . These discrepancies may be attributable to differences in strain or hormonal status of the animals . A number of additional growth factors and cytokines have been associated with the post-PNX response. For example, both serum and bronchoalveolar lavage fluid from PNX rats were reported to have increased tumor necrosis factor-α content . Repetitive injections of exogenous epidermal growth factor during the interval of rapid growth in rats increased the lung volume, weight and epidermal growth factor receptor expression as compared with untreated animals . Data from pregnant rats subjected to PNX support the premise that mitogenic factors are present in the serum of PNX animals. Pregnant and non-pregnant rats undergo similar courses of compensatory lung growth; in contrast, fetal lung growth is enhanced in pregnant rats subjected to PNX . This effect is specific to the lung, as increases in DNA content and tissue mass are not observed in fetal liver, kidneys or placenta . These data suggest the presence of unidentified lung-specific growth factors in the circulation of pregnant PNX rats. These unique observations deserve additional investigations in light of their potential importance in both normal and abnormal growth of the fetal lung. In the past two decades, a number of investigators have examined physiological adaptations to exercise following PNX in dogs [14,44]. Dogs are highly suitable for studying mechanisms that regulate recruitment of diffusion capacity during exercise because they are easily adapted to treadmill training. This model has led to significant advances in understanding how adequate gas exchange is maintained during intervals of increased oxygen demand following PNX. In foxhounds, the primary adaptive mechanism to loss of diffusion capacity resulting from PNX depends on which lobes are resected. In these dogs, the left and right lungs account for 45 and 55% of total pulmonary tissue, respectively . On removal of the smaller left lung, adequate gas exchange is achieved by the existing diffusion reserves . In contrast, if the right lung is resected, compensatory growth commences and diffusion capacity is augmented with additional lung tissue . Diffusion capacity during heavy exercise, as measured by a carbon monoxide rebreathing technique, is significantly higher after resection of the right lung as compared with the left lung , suggesting a threshold at which compensatory lung growth is initiated. In light of this threshold observed in dogs, controversy regarding alveolar multiplication following PNX in other species may reflect, in part, variations in the amount of lung tissue removed. A comparative study of volume restoration and the quantity of lung tissue resected among different species may provide useful information to address this issue. Adaptive responses to PNX are more vigorous in immature dogs as compared with adults. In puppies, right lung resection elicits compensatory growth of the remaining left lung, completely restoring gas exchange capacity . In adult dogs, structural and functional adaptation reaches no more than 70–80% of the initial capacity for gas exchange . More recent studies in dogs demonstrate that inhibition of a shift in the mediastinum caused by an inflatable prosthesis significantly depresses, but does not eliminate, adaptive responses in the remaining lobes [26,45]. Following right PNX, the left lung expands somewhat despite the presence of the prosthesis, primarily because of local diaphragmatic depression . This anatomical change is associated with a 20% increase in volume , suggesting some physiological adaptations to tissue resection occur despite the absence of space within the chest cavity. Hemodynamic responses also differ between young and adult dogs following PNX. During peak exercise, mean pulmonary arterial pressure is ~60% higher in dogs subjected to right PNX as adults compared with age-matched animals subjected to thoracotomy only . In contrast, mean pulmonary arterial pressure in dogs pneumonectomized as puppies and raised to maturity is similar to that of identically treated SHAM-operated control animals . Similar observations have been reported in humans; pulmonary hypertension is not a frequent post-surgical complication following PNX in children whereas adult patients, especially those with impaired lung function, appear to be at risk for pulmonary hypertension . Compensatory lung growth is generally considered to be dysanaptic, in that accumulation of lung tissue and increased parenchymal complexity are not accompanied by multiplication of intra-acinar airways. A recent study in foxhound puppies reported, however, that the total number of respiratory bronchiole segments and branch points in PNX puppies are similar to those present in both lungs of control animals . This observation has provided the first evidence of canine respiratory bronchiolar growth associated with the compensatory post-PNX growth response. Despite the widespread commercial availability of inbred strains of mice and frequent usage of these animals as models of both physiological and pathophysiological processes in the lung, relatively little information is available regarding post-PNX compensatory lung growth in mice [4,5]. Recent research from our laboratories defined the characteristics of murine lung growth during the immediate post-PNX interval. Representative data concerning the compensatory response in C57Bl/6 mice is depicted in Figure 1. In male C57Bl/6 mice subjected to SHAM surgery, both total lung weight (TLW) and right lung weight (RLW) normalized to BW declined slightly over a 10-day interval, reflecting continual somatic growth in the absence of significant lung growth. 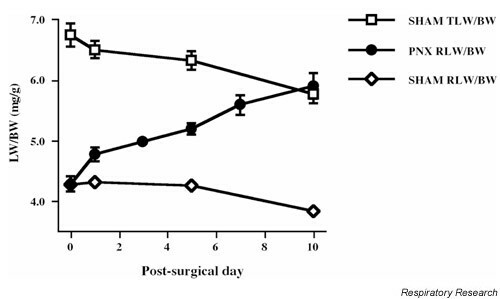 In contrast to rats, an initial post-operative lag in accumulation of lung mass was not evident in PNX mice; the RLW/BW ratio increased in a linear manner between post-surgical days 1 and 10. On post-surgical day 10, the PNX RLW/BW ratio was essentially equivalent to the TLW/BW ratio in SHAM-operated animals. No further increases in the PNX RLW/BW ratio were evident at later times. Similar results were observed in male animals of the BALB/c , A and CXBH strains, as well as in female athymic (nu/nuHsd) mice (LM Brown, unpublished observations, 1996). Post-partial pneumonectomy (PNX) compensatory lung growth in male C57Bl/6 mice. Anesthetized male C57Bl/6 mice were subjected to either a left PNX or a sham thorocotomy (SHAM). On specific days following surgery, animals were sacrificed and lungs were removed; right lung weight (RLW) and total lung weight (TLW) were recorded. Lung weight (LW) was normalized to body weight (BW) and plotted as a function of post-surgical day. In mice subjected to SHAM surgery, both the TLW/BW and RLW/BW ratios declined over the 10-day study. Following resection of the left lung, the RLW/BW ratio increased in a linear manner between post-surgical days 1 and 10. On post-surgical day 5, the PNX RLW/BW ratio was 5.2 ± 0.1 mg/g, a value statistically greater than the RLW/BW ratio in SHAM animals (P < 0.001). The PNX RLW/BW ratio was equivalent to the TLW/BW ratio in SHAM-operated animals by day 10. PNX mice gained 40.3 mg right lung tissue by day 10 at a rate of 4.3 mg tissue per day. Data represent the mean ± SE of one experiment where n = 5-8. Where error bars do not appear, they do not extend beyond the symbol. Pre-disposition to lung tumorigenesis varies substantially among inbred strains of mice; these animals, therefore, are particularly useful for studies of the genetic basis of lung tumor formation . Following carcinogen exposure, the majority of lung tumors that develop in mice are pulmonary adenomas. The genetic, biochemical and morphological characteristics of murine pulmonary adenomas and the early stages of human adenocarcinoma are remarkably similar . As such, mice are a clinically relevant model for the study of lung cancer and have been used extensively in carcinogenesis experiments focused on elucidating the cellular and molecular events that contribute to cancer progression. A typical adenoma promotion protocol involves a single exposure to a carcinogen followed by repetitive administration of a tumor-promoting agent, such as butylated hydroxytoluene (BHT). Exposure to BHT causes acute pulmonary injury in mice and, as a result, elicits a repair process characterized by proliferation of pulmonary epithelial cells . Similar to PNX, excision of 70% total liver mass induces rapid hyperplastic growth in the remaining hepatic tissue that restores the initial organ mass within 2 weeks . It is well established that liver regeneration following partial hepatectomy promotes liver tumor growth in carcinogen-treated rodents [53,54]. In those treated animals, cellular proliferation associated with liver regeneration also promotes clonal expansion of initiated cells. In light of these observations, we hypothesized that rapid lung growth following PNX would mimic the cellular proliferation induced by tumor promoting agents. To determine the consequences of PNX on lung tumor formation, BALB/c mice were subjected to PNX at various intervals before or after a single carcinogen exposure. Data generated from these experiments demonstrated that PNX increased both lung tumor multiplicity and diameter in a manner similar to short-term treatment with BHT . Furthermore, lung tumors in PNX mice had morphological characteristics similar to those produced by chemical tumor promotion. . PNX-dependent stimulation of lung tumorigenesis in carcinogen-treated mice is a novel model system whereby the consequence of rapid lung growth on cancer progression can be investigated. A number of pathophysiological conditions necessitate lung resection in humans. In current clinical practice, pneumonectomy, lobectomy or wedge resections are frequently performed on patients with primary or metastatic lung tumors; nevertheless, cancer recurrence is a frequent post-surgical complication [55,56]. The biological mechanisms that underlie recurrence are poorly understood. It is, however, generally accepted that a microenvironment conducive to wound healing or organ growth would also support growth of cancer cells [57,58]. Partial resection of organs that have the capacity to undergo compensatory growth may thus also stimulate outgrowth of additional primary tumors or latent micrometastases. In fact, a number of studies in rodents have shown that partial hepatectomy increases both the number of artificially induced metastases and the growth of locally implanted tumors [59,60]. The consequence of post-PNX compensatory lung growth on the metastatic process is currently under investigation (LM Brown, unpublished observations, 2001). The extent of compensatory lung growth in humans following PNX or lobectomy is incompletely investigated; a number of long-term physiological studies suggest, however, that some degree of compensatory growth may occur, especially in children . In adults, post-operative increases in lung volume appear to depend on alveolar distention and recruitment rather than on alveolar multiplication . The consequences of PNX in humans have been studied primarily through analysis of post-operative pulmonary function. Interpretation of data gathered from pulmonary function tests must be qualified with the knowledge that PNX is rarely performed in healthy human subjects. Residual lung disease and patient illness frequently compromise the condition of the remaining lobes  and thus the potential for post-PNX compensatory growth in otherwise healthy adults is poorly defined. Animal models offer invaluable tools for understanding both physiological processes and mechanisms of human disease. Because post-PNX lung growth occurs in a number of species widely used in biological research, potential applications of the PNX model are numerous. Experimental observations in rats provide a foundation for subsequent studies in other species, including dogs and mice, each of which offers unique advantages. For example, dogs are easily trained to exercise in a controlled environment and may therefore offer an excellent vehicle to define mechanisms by which diffusion capacity is recruited and maintained following partial resection of the lung. Although most studies of compensatory lung growth have been performed in rats and dogs, mice may prove a more powerful research tool. Commercial availability of genetically altered mice will support investigations of the consequences of gain and/or loss of gene function on the compensatory growth response. Transgenic and knockout technologies, which can be applied most efficiently in mice, will permit the genetic basis of both the physiological and pathophysiological aspects of compensatory organ growth to be elucidated. Cytokines and growth factors essential to liver regeneration following partial hepatectomy have been identified utilizing these types of animal models . Investigations of compensatory lung growth in transgenic mice may thus offer a unique in vivo system to elucidate cellular and molecular events that initiate, regulate, and terminate both normal and compensatory growth of the lung. Finally, our recent studies of pulmonary tumorigenesis in lungs of partially pneumonectomized animals suggest that mice provide a unique model system that may facilitate definition of both the physiological and pathological mechanisms that underlie the stages of lung cancer progression. By modulating gene expression in these animals, the contribution of individual gene products to lung tumorigenesis may be delineated, along with their potential role in human lung cancer. This work was supported by grants R01-HL 20344 (DER), R01-HL 62869 (SRR), and T32-GM08619 (LMB) from the National Institutes of Health.